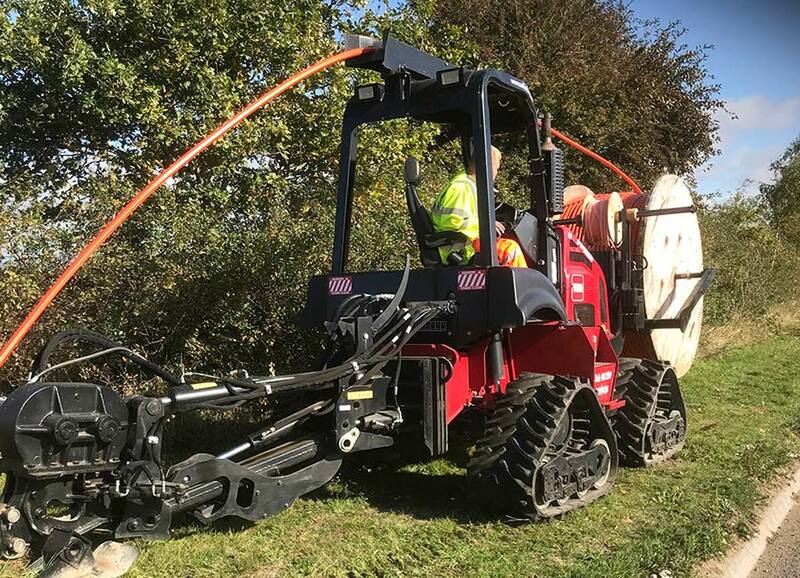 For fast, cost effective and minimum disturbance installation of smaller services, look no further than our vibratory mole plow. The 86 horsepower case 860 can install ducting or services direct into the ground, up to 1000mm deep and up to 90mm wide. This is the ideal machine for telecommunication ducting, private water supply and various other ducts that may be required for services. Our highly specialised team are capable of installing link boxes and chambers as required and are also qualified to Thrust bore up to 130mm when open cutting is not an option. The highly manoeuvrable 860 allows for the blade of the plow to be fully offset, allowing all wheels to remain in tarmac greatly increasing tractive forces and minimising surface scrubbing during the installation in narrow verges. It also has the ability to spread all four wheels across the machine width to massively reduce the impact of the machine on sensitive areas such as sportsfields and lawns.